When the huge solar farm just outside of Las Vegas called Ivanpah opened up in early 2014, many lamented that this type of solar plant, called solar thermal, could soon become a dinosaur. Late last week another of these large solar thermal farms was officially turned on, and it truly could be one of the last of this size built in the U.S., thanks to a one-two punch of changing incentives and economics. Large utility-scale solar panel farms use rows and rows of solar panels to directly convert the sun’s energy into electricity. Solar thermal farms, on the other hand, uses mirrors to concentrate sunlight to heat liquid that produces steam and makes electricity from a turbine. These sites are essentially using the heat of the sun to produce electricity. 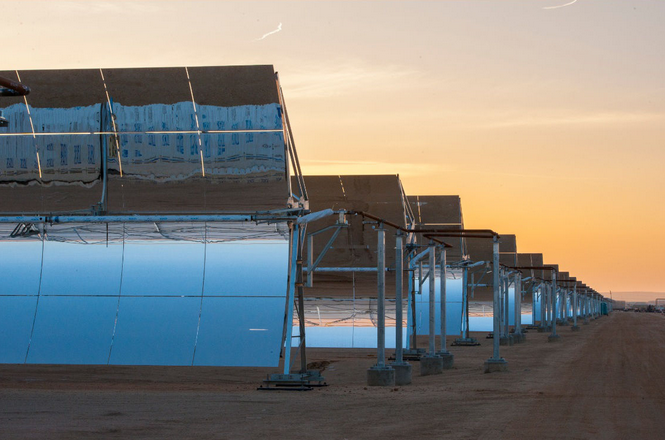 Spanish power giant Abengoa celebrated the opening last Friday of a huge 280 MW solar thermal farm called Mojave Solar, built just outside of Barstow, California. The project can provide enough solar power for 90,000 homes in California, and was built across 2 square miles. Abengoa said the site will generate $169 million in tax revenue over 25 years, provided a peak of 2,200 construction jobs, and now employs about 70 people. California utility PG&E is buying the power from Mojave Solar, and the facility will help PG&E meet California’s state mandate to generate a third of its electricity from clean power by 2020. Abengoa finished another 280 MW solar thermal farm in Gila Bend, Arizona at the end of 2013. Years ago, power companies were as bullish on solar thermal farms as they were on solar panel farms, which are increasingly being constructed in the deserts of California, Nevada and Arizona. But a few years ago the price of solar panels began to drop dramatically, from an average installation cost of $5.79 per watt in 2010, according to the Solar Energy Industries Association, to $2.71 per watt in the third quarter of 2014 (this is the average cost blended across all types of installations). Utility-scale solar panel installations can be as low as $1.68 per watt according to GTM Research. As a result, some power companies that had solar thermal farms planned converted these sites over to solar panel facilities. Other companies that had developed businesses off of developing solar thermal sites cancelled projects in the U.S. that were no longer deemed economical and focused internationally. A look at the heliostats and 2 of the 3 towers of Ivanpah. Taken from the 6th floor of the Unit 1 tower. But ultra cheap solar panels are only part of the headwinds facing large utility-scale solar thermal farms in the U.S. There’s also a couple of important incentives that have been changed as well. First off, the federal investment tax credit (ITC), which delivers a 30 percent tax credit to solar project developers, is planned to be cut to 10 percent by the end of 2016. While it could be extended, the uncertainty is threatening the construction of utility scale solar farms, using both solar thermal and solar panels. The New York Times noted in an article this weekend that there are no future large solar thermal projects planned in the U.S.
Then there’s the fact that federal incentives in the form of loan guarantees are also no longer widely available for solar thermal plants. When Ivanpah was built, it used a $1.6 billion loan guarantee from the U.S. government to construct its 347,000 mirrors and three huge 450-foot towers. Likewise, Abengoa’s Mojave Solar used a $1.2 billion loan guarantee to finance construction. These types of large loans are no longer regularly coming out of the Department of Energy. Utilities calculate how much clean power they need (most likely to meet a state mandate) and then compare it to the cost of building a new natural gas plant, a wind farm or either type of solar farm. If natural gas plants, or other types of clean power, are cheaper than solar thermal facilities, then it’s an easy decision. But large solar thermal farms could still find life outside of the U.S. They can uniquely store thermal energy at night, providing electricity far longer than solar panel farms without energy storage can. BrightSource, which is the startup behind the Ivanpah site, recently announced a joint venture with China’s Shanghai Electric Group to build utility-scale solar thermal plants in China. Their first proposed project is to build two 135 MW solar thermal projects in the Qinghai province of China. Yes, except DOE finance was the last to learn this lesson with its “we don’t pick winners mentality” and the taxpayers are still on the hook for yet more policy mistakes. Competitive solar would be farther down the road to grid parity without these under reported policy mistakes. We have a portolio mix with carbon, and we can with solar. Thermal is very capital intensive, but doesn’t require incredibly expensive silicon fabs. If you’re already building natgas backup, you’re also buying generators, turbines, and pipe. This is a well-researched article, but I find it hard to be believe that photovoltaics have become more cost effective than solar thermal in terms of price per unit of electricity produced. A solar thermal plant has roughly the same production efficiency as a coal plant, 35-40 percent, while commercial scale photovoltaics farm would be lucky to convert half that. What I suspect is more likely is that a photovoltaics farm is more easily scalable, requires far less capital costs than a solar thermal, and–as you say–still produces enough energy for utilities to meet state mandates. Incentives definitely help photovoltaics, but I think their modular design, siting closer to load centers, and quick permitting give them a huge advantage over solar thermal, although over their respective lifetimes a solar thermal plant would produce more electricity and electricity at a lower cost than a photovoltaics farm. There are more advancements being made in photovoltaics then thermal energy. Unless its because I am not hearing about them?